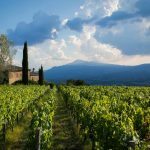 Arezzo villa dating back to the 18th century with annexes, olive grove, vineyard and land. 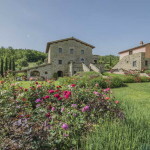 Rural location but within easy reach of Arezzo city centre and the A1 motorway exit. 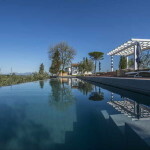 This Arezzo villa property has a total surface of 680 square metres and is composed as follows. Ground floor: entrance from the porch, basement room with living area, dining room and kitchen, bedroom with bathroom, office and bathroom. Still on the ground floor is set the self-contained apartment with living area, bedroom and bathroom. 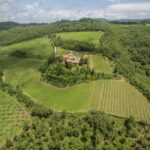 First floor: covered loggia with panoramic view, sitting room with fireplace and parquet flooring, kitchen, library, laundry, bedroom, bathroom, master bedroom with dressing room and en suite bathroom, dressing room. 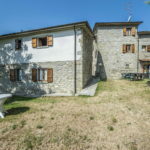 Agricultural annex (98 square metres) with stone construction. Agricultural annex (50 square metres) with brick construction. Both these two buildings need a complete restoration. 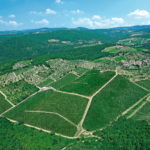 The property is completed by 5000 square metres of vineyard, 8500 square metres of olive grove, 1000 square metres of agricultural land and 4,6 hectares of woodland.